Here's version 2.3 Beta 9 with the ability to create Quicktime (.mov) videos from a path of camera locations recorded by the user. 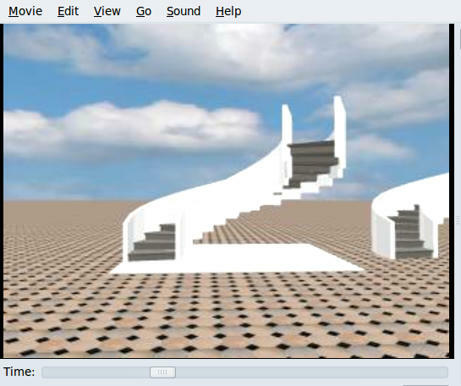 I hope you'll appreciate this feature I previously announced in Sweet Home 3D blog, and won't find it to complicate to use. I tried to make it simple enough, but it will probably take you a little time to master it. Don't hesitate to make suggestions. I'm looking forward discovering your nice videos. Note: Quicktime format was chosen mainly because the free JMF library I chose is able to generate only AVI or MOV videos, and MOV videos seem to support more sizes and frame rates. On behalf of many SH3D users THANK YOU for this nice feature. It is indeed easy to use. Unfortunately, every time I click the Create button the program crashes. I have searched for an error log but cannot find it. If it crashes there must be a hs_err....log file somewhere, but I'm not sure it will help. Does it crash as soon as you click on the Create button? Does it crash as soon on any quality level (1/2 and 3/4 levels doesn't work the same)? First, I tried the beta-9 on my Windows Vista laptop and it worked fine when I clicked the Play button. It also works when clicking the Create button and starts making several thousand images. This is a (more or less) slow process: my laptop is now busy making its first movie and rendering image 500 of 3500 or so. I guess that will take another half hour. I managed to find 3 crash reports which I sent to your email. When clicking the Play button on my Ubuntu PC, the virtual man starts walking around my model. But, when I click Create and use quality level 1 or 2, I can only see the number of images that should be created before the program crashes. Following your question, I tried quality setting 3 and 4. See the results below. The following pictures and movies are from my Ubuntu PC. 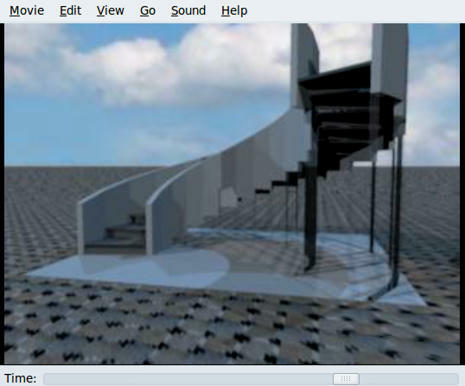 This is a screen shot from the standard render in SH3D. This is a screen shot of the movie in quality setting 3. The quality is a bit disappointing. This is a screen shot of the movie in quality setting 4. The quality is a bit disappointing. And finally a screen shot of the movie in quality setting 1 rendered on my Windows Vista laptop, played on my Ubuntu PC. I think outside views in quality 3 and 4 depends on the sky texture. Maybe the images I provided are too blue. I'm curious too see how horizontal maps provided at http://blender-archi.tuxfamily.org/Textures#Horizontal_maps would render. Hans, it should fix the strange behaviour you noticed, and Richard, it doesn't break up the texture applied on a wall with openings anymore. One last thing, nobody ever complained about the color used to draw the top of walls in the 3D view. I'm opened to change it if you give me good ideas. Today, I decided to try to apply texture on furniture, and guess what? I felt it worked well enough to release this new feature in version 2.3 Beta 12. From the image below, you'll see that the texture image isn't mapped on the left and the right sides of an object as expected, but I think it's not possible to do better with no additional parameter which would be probably to complicated for many users. Nice new version of SH3D! I just played around with the movie tool and it worked nicely on my Linux system. I'll be checking out more later. Is this Beta using DirectX or OpenGL for J3D? Well, guess what; it works on my notebook (that's a huge improvement!!). Please try version 2.3 with this link to a JNLP file for DirectX. But then, the user would be able to change a preference value from a contextual menu, something not common. It would also imply to add these menu items to main menu bar too, since any contextual menu must exist also in the main menu (just a basic ergonomic rule). At this moment, I would prefer to add a keyboard shortcut to access directly to preferences. What are the common shortcuts for Preferences under Windows and Linux? I just updated the Beta version to fix a few bugs and add the ability to import textures libraries with the new menu item Furniture > Import textures library. You'll find an example of a textures library in the wood.sh3t file joined to this message. A SH3T file is a ZIP file. 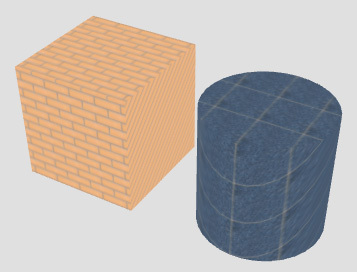 It contains texture image files and a PluginTexturesCatalog.properties file that describes each texture image. 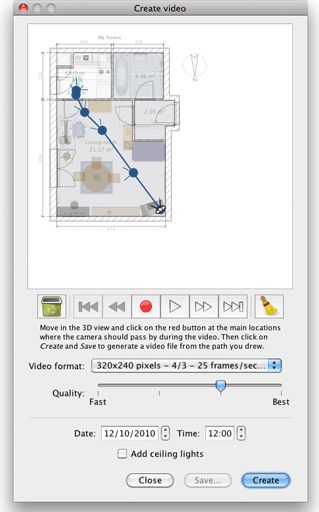 The version 2.3 Beta 15 released today provided the ability to create dimensions with a double click on the border of a piece of furniture, the side of a wall or a room. It's probably the last new feature (at least one that modifies the user interface) of the version 2.3, that will be released once the new dialogs and menu items will be translated. Don't hesitate to stress Sweet Home 3D and report problems.